What Does The Beat Want? It’s been a big internet week for me. First, I launched this new blog (if you haven’t switched your Livejournal bookmarks, do so now!) Then, out of nowhere, someone I’ve never even met made this smashing video out of a monologue I wrote 20 years ago, and it’s caught on like internet wildfire. 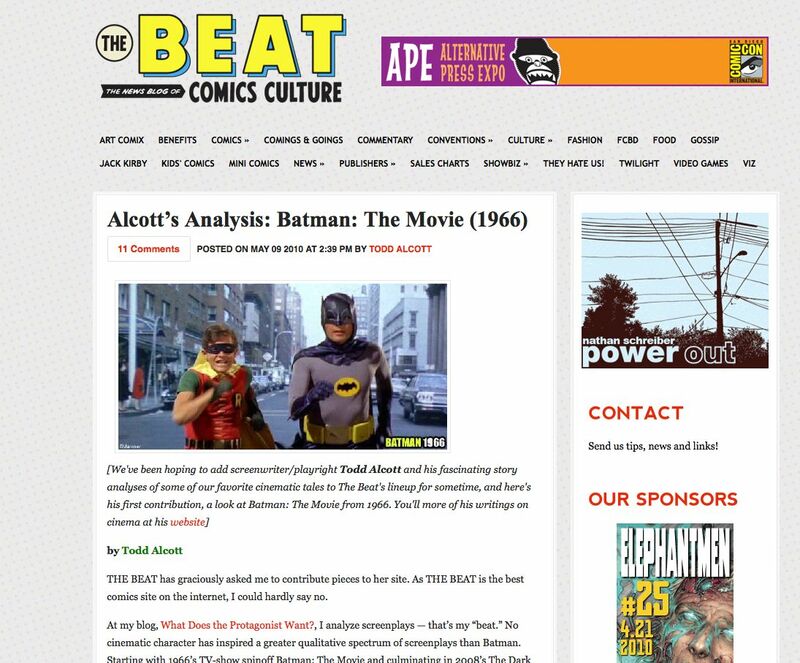 And now, my good friend Heidi McDonald at The Beat has started re-posting some of my earlier comics-movies-related analyses, starting with my look at 1966’s Batman: The Movie. This is the first time one of my blog pieces has been re-posted in another forum, but the reviews are in and readers are ecstatic! I can’t help but think that if you had made it a two parter, with the first being this: http://toddalcott.livejournal.com/66037.html, things might have gone over better. If I first wasn’t familiar with your blog already and second hadn’t read the other first, I might have concluded something similar: that you somehow didn’t understand the concept of so-bad-it’s-good and therefore weren’t worth reading. It’s just a matter of introductory frame of reference. Appreciative yet sardonic humor can be difficult to detect, especially if this is the way you introduce yourself to readers who might be unaware that your first piece will be in this fashion. Chances are just as great, however, that some–presumably Aspergers-laden–Batman fanboys, possessing uncomfortably underdeveloped senses of humor, assumed you were serious and jumped all over it. The only thing that would have saved you from such a nerd pile-on would have been an over-apologizing “this is a joke, ha ha!” sign, ala same from the beginning of the movie. Nothing better than ruining a joke by explaining it, right? I’ve been reading your blog for a while now via RSS. The new format only gives a small sample of the text whereas the previous version would show the whole entry. If the change was done on purpose, then no problem. I understand you might want subscribers to click through to give you a page view count, and I’m happy to do so. However, if you didn’t realize the change, then . . . well, I hope I’m not presumptuous in asking you fix it. Thanks a lot. I know nothing of RSS and how to work it, but I’ll try and figure out how to make using the blog easier. Thanks for the heads-up. Dag, Todd. You really stirred something up in these here Beat readers. Congrats on your ever-expanding web presence! But have those readers seen the original TV series? Don’t take them too seriously. Think of Adam West. Heh, looks like you kicked a sacred cow.